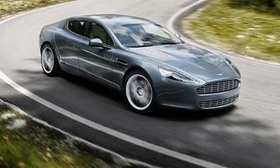 Deliveries of the Aston Martin Rapide are to begin next spring. Aston Martin has set the base price for the Rapide in the United States at $199,950. For just less than $200,000, you'll get a Bang & Olufsen sound system, heated memory seats and an active suspension system. Of course, there will be options that push the sticker price above the $200,000 mark. Under the hood is a 6.0-liter V12 rated at 470 hp and 443 lb-ft of torque. The four-door Rapide arrives in dealerships next spring, but you can place your order now. The car will be built at Graz, Austria.